Choosing an engine oil for your vehicle can seem like a daunting task. While referring to your car’s user manual is one way to determine which engine oil to buy, you may not always have a manual. If for some reason you don’t have the manual there are a couple of things that you need to keep in mind when buying engine oil. The first is the API value. API stands for American Petroleum Institute. You’ll also see a two-letter designation on the container as well like “SL” which refers to group of laboratory and engine tests which include a series of high-temperature deposits. The other thing you need to check is the viscosity or the thickness as some people refer to it. You need to choose a viscosity based on your engine’s mean operating temperature as well as the conditions in which the vehicle is driven. If there is one value that motorists need to understand it is the ‘W’ rating which stands for winter. For instance, a 0W-30 rating means that the oil can flow at zero degrees during winter and can withstand engine temperatures of up to 30 degrees. As a rule of thumb remember that motor thins as it becomes hot and will thicken at a colder temperature. However, the more resistant it is to thinning, you’ll notice a higher second figure. What viscosity should I choose? We recommend that you change the engine oil at least twice a year. Since winters in the UK can go below freezing it's important to choose an oil that has a below zero rating starting in November. Then change the engine oil again in March this time use one that has a higher lower end rating like 10W – 40. Always pick a top end brand like Shell or Mobil for your vehicle. Branded engine oils use a combination of additives which helps to prevent your engine from excessive wear. 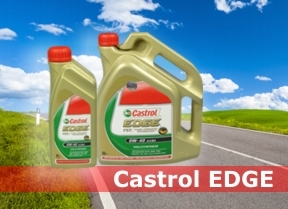 Also, good quality engine oil results in better fuel consumption because the engine is performing optimally. We currently sell the largest selection of branded engine oil by well-known brands. All you need is to choose the right one for your car and buy it at the lowest price.